When I decided to make hummus yesterday, I wanted to make it something a little out of the ordinary. I use beets in hummus a lot, because I love the shocking pink flavor they give it, as well as the subtle sweet flavor, but this time I was thinking something green would be nice...what to use though? Spinach? No, not enough flavor...but I did have some fresh shelled english peas! Yes, peas would be perfect, they would give the hummus a different sweet flavor, and tint it a lovely pale green! I decided that some herbs in my hummus would be great as well...so I added fresh cilantro and basil to give it some interesting fresh flavor. I used almond butter insted of the traditional tahini, because I thought that the sweetness of the almond butter would compliment the sweetness in the peas. I used white beans as my base bean of choice this time, because I didn't have any chickpeas on hand. The hummus turned out wonderful! Not like any bean spread I had ever tasted before...and the peas gave it a wonderful lightly sweet flavor! It would be good just as is with some cucumbers or corn chips for dipping, but I thought it would make a wonderful crostini, so I spread some on toasted baguette slices and topped it with roasted cherry tomatoes that I had just picked from my Dad's garden. 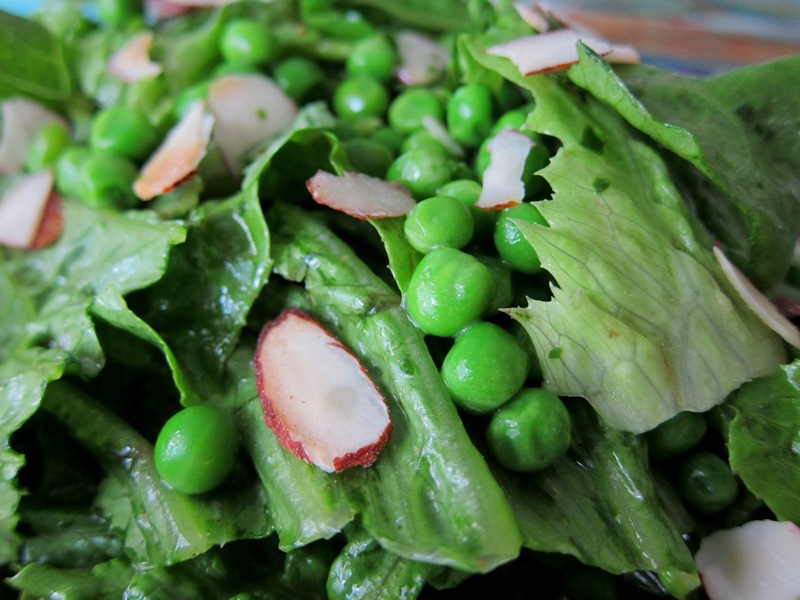 To make it a full meal, I made a simple side salad with more fresh peas romaine, and toasted almonds in a basil lemon vinaigrette. It all turned out to be a wonderful fresh summer dinner! 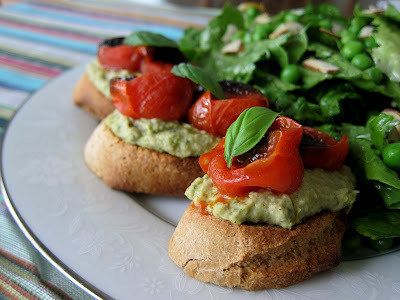 I have included the recipe for the crostini and salad as well as the hummus recipe, in case you are interested in either of them. 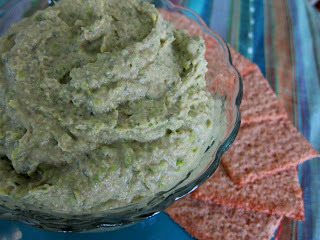 The pea hummus could also be made with frozen peas if you do not have access to fresh. This recipe is definately a must try if you love hummus, and are looking for something a little different than the classic with chickpeas and tahini. Preheat oven to 475 degrees. Line a baking sheet with foil. Toss cherry tomatoes with a little olive oil, and spread out on sheet. Roast for about 20-25 minutes until they are burst, and starting to char a little bit. Meanwhile, brush baguette slices with olive oil, and toast in the oven on another lined baking sheet for about 10-15 minutes until lightly browned and crisp. Let both tomatoes and bread cool to room temperature. 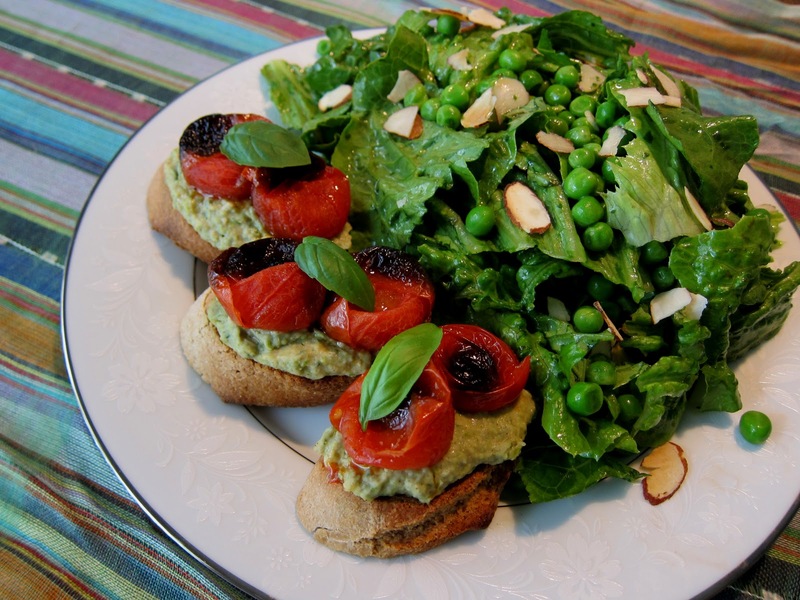 Spread a bit of the pea hummus on each baguette slice, and top with a couple cherry tomatoes and a basil leaf. Whisk dressing ingredients together and toss with romaine, almonds, peas, and basil to coat. Divide salad between 3 plates, and place 3 crostini on each plate as well. In a food processor, combine all ingredients and process until smooth, adding water if necessary to thin out. Serve with chips or veggies for dipping, or as a spread on a sandwich! Love this idea! And now, as the bumper sticker suggests, I can truly VISUALIZE WHIRLED PEAS! ;) It's been so hot here--this is a perfect suggestion. this really sounds very good--I love the combination of herbs and peas-sounds like it tasted fresh and clean. Sounds wonderful! Fresh herbs and hummus--can't go wrong! Thanks for the recipes.